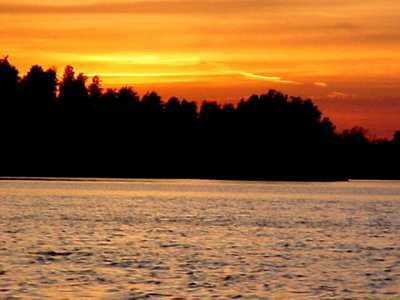 Launch: For the southern lakes: The National Park Service Kabetogama Visitor Center, southeast of International Falls, has an excellent ramp and good long-term parking. 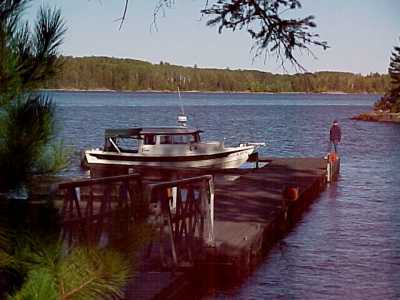 For Rainy Lake: Rainy Lake Visitor Center, also National Park Service, has another fine ramp and good long-term parking. Nearby campsites: Woodenfrog State Forest Campground is nearby and is a good campsite. They also have a good ramp, but the parking may be crowded and security perhaps not as good for the tow vehicle and the camper. Comments: Voyageur National Park has two sections, separated by a dam at Kettle Falls. There is a trailer service available at the dam. For $20, one-way, you can cross the dam. Alternatively, use the ramps at Kabetogama and at Rainy Lake and do both ends to the middle. Saves dollars and is an easy trip. The ramps are excellent with easy parking. 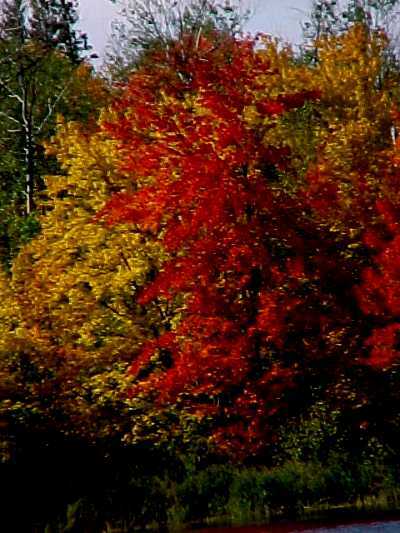 -----The fall leaves were turning their golden colors, the sky was blue, and it was time to for us to heed the President's words and return to our normal lives - which, for us, meant back to the water. 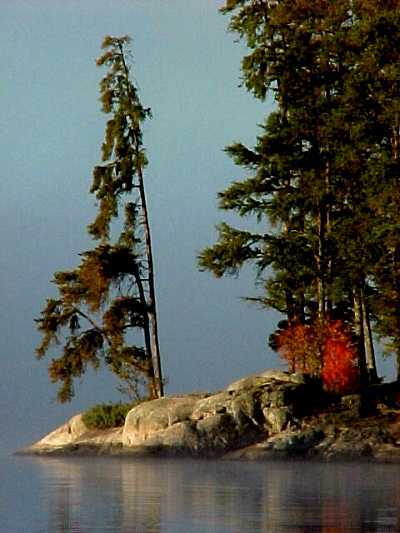 We had heard, from the C-Dory site, how beautiful Voyageur National Park is for a fall cruise. We hitched up Halcyon, and headed to the Canadian border. -----We arrived at Woodenfrog State Forest Campground just before dusk and found a site to camp. It was snug, but we just fit without breaking off the trailer. As usual, at a new cruising destination, we didn't know where to begin - and that's a rather essential part of boating! So, we decided to go to the Park's Kabetogama Visitor Center. What a good choice - great boat ramp, good parking for the truck, and helpful folks (with charts) in the Visitor Center. We launched and only went a few miles into a secluded cove. We were immediately greeted by the mournful calls of a loon searching for its mate. It was a beautiful spot to read in the cockpit or put waypoints into the Chartplotter. 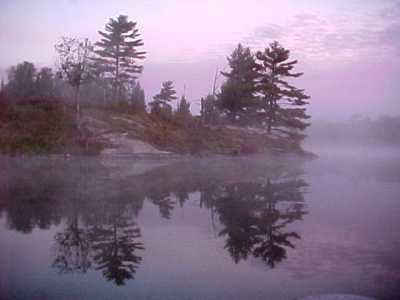 -----This is not our first time to the Boundary Waters. We were here canoeing with the children in August 1973. Twenty-eight years ago! Time is a linear function to a scientist but not in our memories. The details of that trip are as clear as yesterday - even the taste of the blueberries. It was a marvelous time of loons, paddling, and campfires. 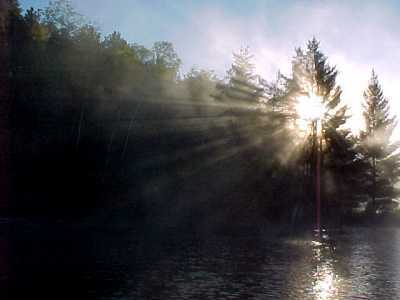 In 1990, we returned for a weeklong gathering with our adult kids, again canoeing those enchanting waters. Four years later, we skied across the frozen surface of those lakes. We lived in a yurt with our daughter and her husband for a cold and memorable Christmas together. -----So, El and I are not new to the Boundary Waters - but this trip on Halcyon is unique. Previously, we traveled on the water but we lived on the land. We were terrestrial creatures who ate, slept, and gathered around the campfire on the land. -----This trip, aboard Halcyon, we are truly aquatic. We rarely come to land. We travel, eat, and sleep solely on the water. What a different perspective! It is always from the water toward the land. We are detached from the moss, trees, and rock. -----The forest muffles sound, but water carries it vast distances. On the boat, we use our ears as much as our eyes. We are surrounded by the lap of waves on the hull and the calls of loons and squirrels. A Hermit Thrush, who seems to think it is springtime, trills his melodious, mysterious whistles - the Beautiful Singer, we have always called him. 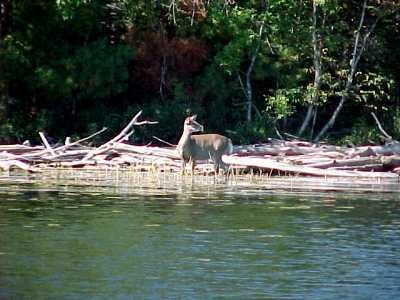 Deer strolling the shore a few yards away look to the land for danger and at us, swinging on anchor, with curiosity. -----Weather, always important when living outdoors, is just as dominant for us. Rain is reduced to a mere inconvenience when on the boat, with its snug cabin. Even cold is less significant, since we have a dandy stove. Here, as in a canoe, the wind is the dominant factor. Waves rock us and we swing to the wind while on anchor. Its direction determines where we anchor and its intensity dictates whether we travel. Our comfort and stability is in the hands of Æolus. -----The water routes and anchorages available choose our travel plans for us. The charts give a false impression of certainty but nature is not to be so easily confined to a mere piece of waterproof paper. Rocks, indeed whole islands, are not on the charts or misplaced. Navigation by GPS and chart is only a probability. The time-honored necessity of using eyes, judgment, quick reactions, and ability to read water are still required. 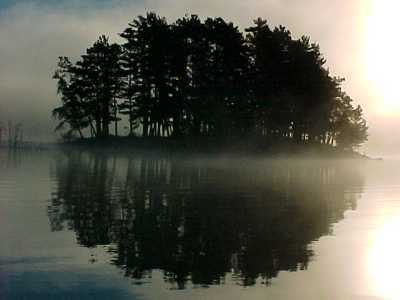 -----It is nice to live on the water in Boundary Waters. Here, in Voyageurs, where boats with motors are allowed, we have been given a new and unique experience aboard Halcyon. It is amazing to live and travel in a wilderness setting and have all the comforts of home. -----WOW! An Aurora Borealis! El found it, just before turning in. It began as greenish curtains in the northeast. Then the curtains, shimmering, were surrounded by a halo of diffused bright red light on the east and above. We watched as beacons lit and shone, curtains flickered and danced, and the red glow became a deeper, darker hue. What a thrilling experience. It wasn't in sharp definition, because of the light of the half moon, but it was a glory! -----The next morning the auroral glow still shimmered in the north. It appeared to be the sun's predawn lighting the northern horizon, but, eventually, the real sun took over and the sky slowly lit in the east and the aurora faded. 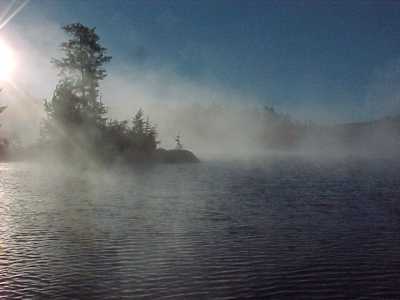 Mist rose off the cold lake surface, a loon called, and another day together on Halcyon began.